We are pleased to announce a new Berkeley Lab report, Income Trends of Residential PV Adopters: An analysis of household-level income estimates. The study relies on a unique combination of datasets to describe income characteristics and trends among roughly 800,000 residential rooftop solar adopters located across 13 U.S. states. It is the most-comprehensive analysis of this type to-date, and one of few to utilize household-level income estimates. The report, which is published in slide deck form along with an accompanying written executive summary, can be downloaded here. A webinar summarizing key findings, hosted by the Clean Energy States Alliance, will be held on May 2 at 10 am Pacific Time (1 pm Eastern). Register for the free webinar here. Residential rooftop PV adopters, as a whole, are relatively high-income compared to the broader population. The median income of all PV adopters in the analysis sample is roughly $32,000 higher than for all households in the same set of states ($92,000 vs. $60,000), as shown in Figure 1. However, much of that difference is attributable to varying rates of home-ownership across income groups—as residential rooftop PV is primarily limited to owner-occupied homes. When comparing only among owner-occupied households, the median income of PV adopters is just $13,000 higher than the broader population ($92,000 vs. $79,000). Notwithstanding the finding above, “moderate-income” households nevertheless constitute a sizeable share of PV adopters. 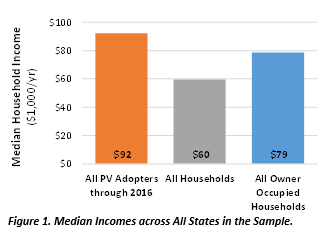 Examining the full income distribution of PV adopters shows that 43% of these households fall within the bottom three quintiles (the lower 60%) of all household incomes among the states in the analysis sample. As one other relevant benchmark, 48% of all PV adopters in the sample fall within Pew Research Center’s definition of “middle class”, which consists of household incomes ranging from 67% to 200% of the U.S. median income. PV adoption has been trending towards more-moderate income households in recent years. The aforementioned findings are based on the cumulative set of PV adopters in the analysis sample, which includes systems installed over the span from 2000 to 2016. However, PV-adopter income profiles are dynamic and evolving. 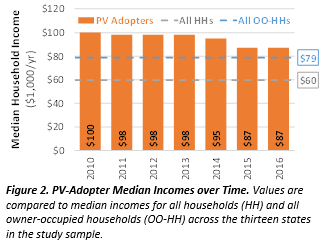 As shown in Figure 2, the median income of PV adopters has been trending downward since 2010 and converging toward the median income for all owner-occupied households. In fact, by 2016, four states (CA, CT, DC, and MA) had reached “income parity”, with median PV-adopter incomes equal to or below the median for all owner-occupied households. PV adoption rates by low- and moderate-income (LMI) households lag behind the broader market. Roughly 3.4% of all owner-occupied households in the 13 states of the analysis sample had installed PV by the end of 2016. By comparison, cumulative adoption among owner-occupied LMI households ranged from 2.3%-2.8%, depending on the particular threshold used to define LMI (the study considers a range of 60% to 120% of Area Median Income). This gap has shrunk over time, as PV adoption has trended towards more-moderate income households. Third-party ownership has been especially prominent among low- and moderate-income solar adopters. Among LMI adopters in 2016, 57% opted for third-party ownership (TPO), compared to 48% of non-LMI adopters. This may reflect greater cash constraints among LMI households, fewer alternative financing vehicles, and/or less ability to monetize tax benefits compared to wealthier households. It is nonetheless somewhat surprising, given the oft-stated concern that lower-income households may have more difficulty qualifying for TPO contracts, given a presumption that they have lower credit scores. Based on these findings and others, the study also identifies a number of broader conclusions and areas for further exploration. For further details, please refer to the full report and executive summary, available here. We appreciate the funding support of the U.S. Department of Energy’s Solar Energy Technologies Office for making this work possible.